Whether it's a commercial contract or simply a backyard project, mastering the job requires a solid first step. 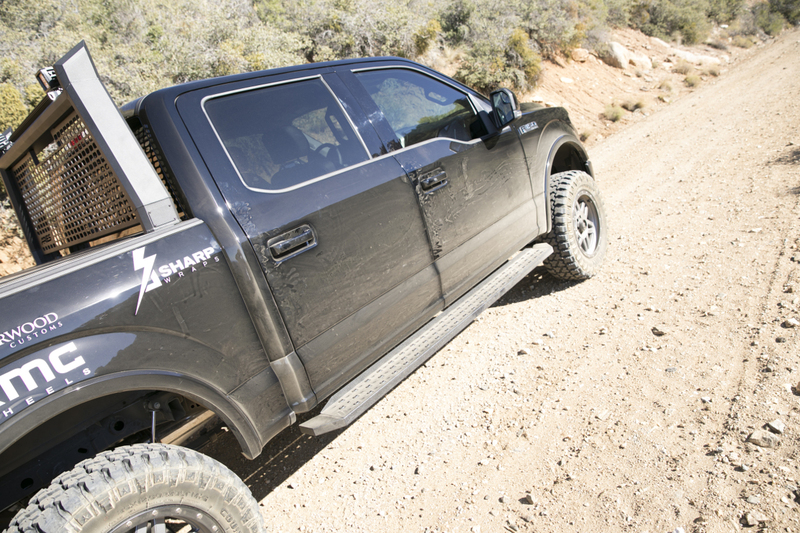 While most running boards offer extra style for your truck, few of them possess the durability and longevity to stand up to the rigors of the jobsite. 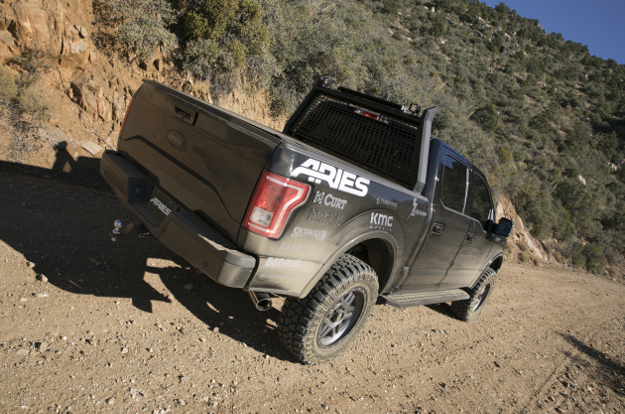 ARIES RidgeStep® running boards are designed to master tough jobs and make it look easy. They feature an all-steel construction, angular look, longwearing treads and no-drill installation. 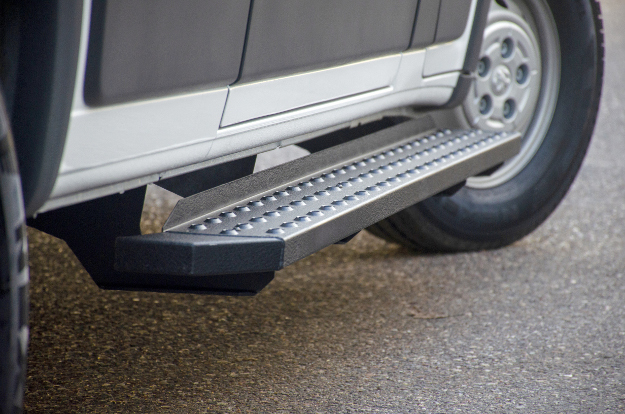 RidgeStep® running boards are perfect for commercial trucks and other work vehicles. 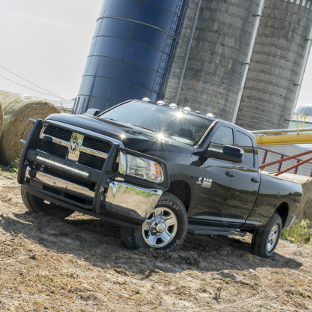 They offer the safety and durability to thrive on the job, while complementing your truck with a professional look. 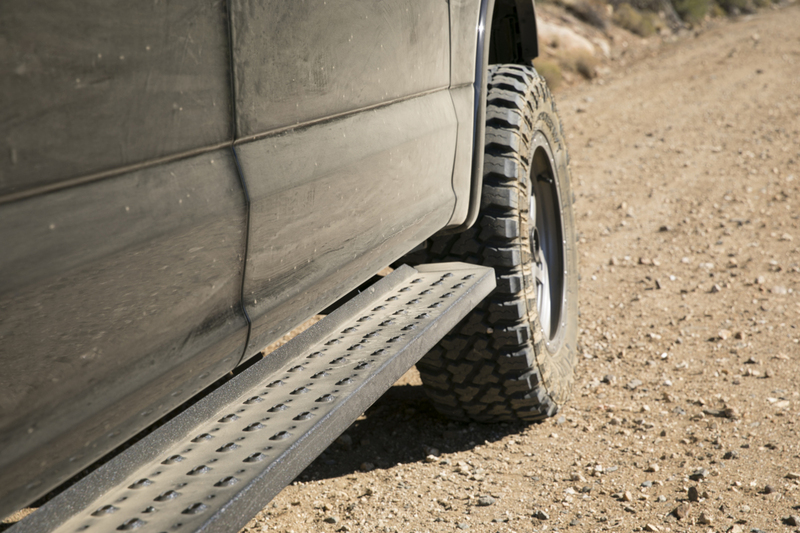 Every set of RidgeStep® running boards is engineered for vehicle-specific application. This means they integrate like original equipment accessories and install quickly and securely with no drilling needed. 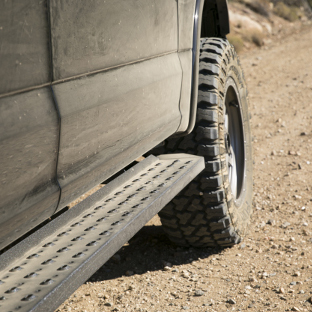 Unlike most other truck side steps, RidgeStep® running boards are built without any plastic parts. From their angular boards and end caps, to their brackets and punched-hole treads, they are constructed from high-strength steel. 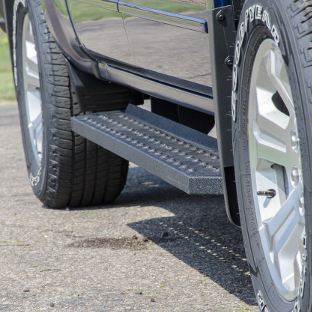 An all-steel construction not only provides a solid step up into the truck, but it also makes RidgeStep® running boards an ideal fit for the harsh conditions of the jobsite. You can spend more time getting quality work done and less time worrying about the survival of your truck accessories. 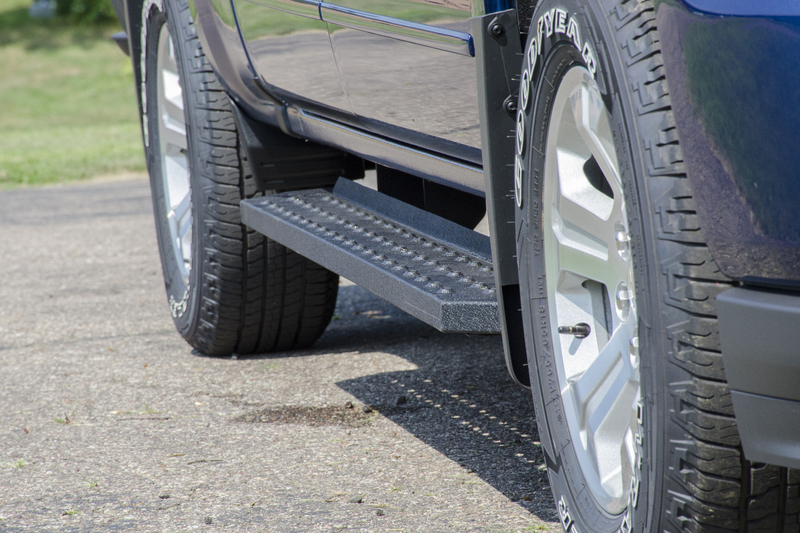 RidgeStep® running boards feature a 6-1/2" wide surface for a safe, comfortable step up into your truck. They also have stamped steel treads, not plastic step pads. The treads have a punched, protruded, circular design to lock onto your boots as you climb in. Because the protruded treads are made from steel, they are also highly wear-resistant. They won't wear down or crack like some cheaper, plastic alternatives, even when exposed to steel-toe shoes, heavy foot traffic and UV rays. 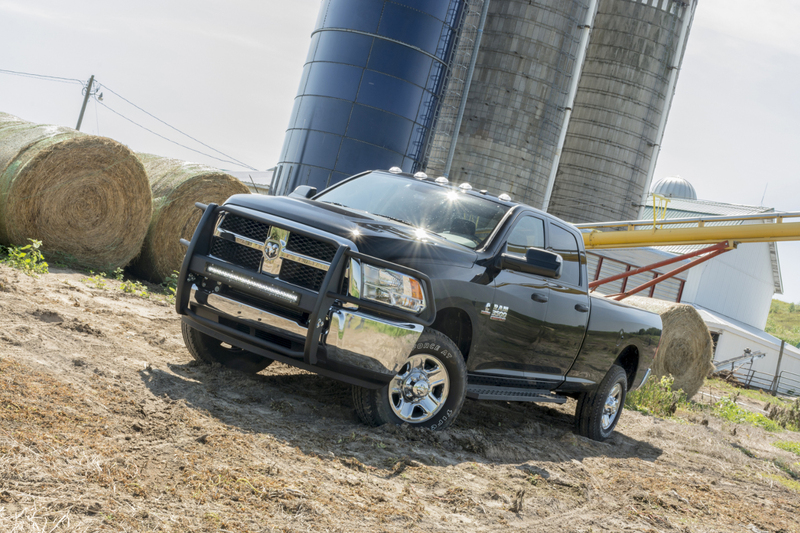 To keep your work truck from becoming all utility and no class, RidgeStep® running boards feature a tough, no-nonsense look. They offer dependable footing and extra style. 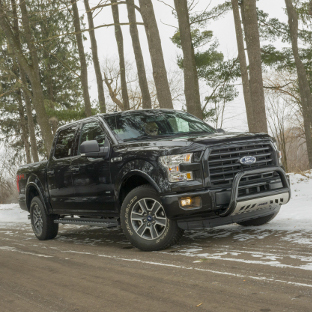 The angular design complements the aggressive body lines of modern trucks. 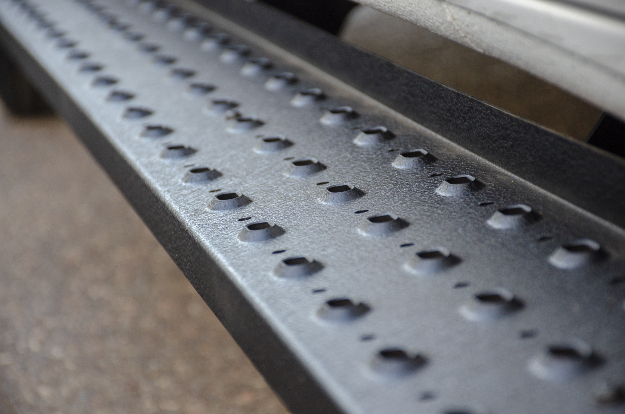 Like the boards, the end caps of RidgeStep® running boards are entirely made from steel. They are welded into place for a durable accent, and they contour to the sides of the truck for a bold look. 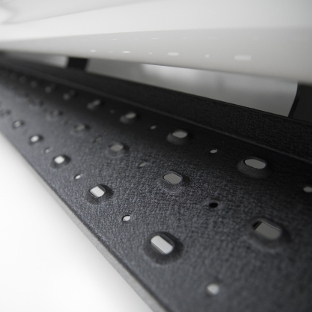 To make sure RidgeStep® running boards can outlast the elements, we cover them in a tough, tested finish. We use a dual-layer finish of E-coat and textured black powder coat to easily resist water, salt and rust, and increase slip resistance for added safety. The textured surface is also uniquely designed to help hide grime and minor scratches on the boards, maintaining a clean, professional finish. RidgeSteps® are also equipped with built-in splashguards along the inside edge to keep the steps free of mud and debris no matter where the job takes you. 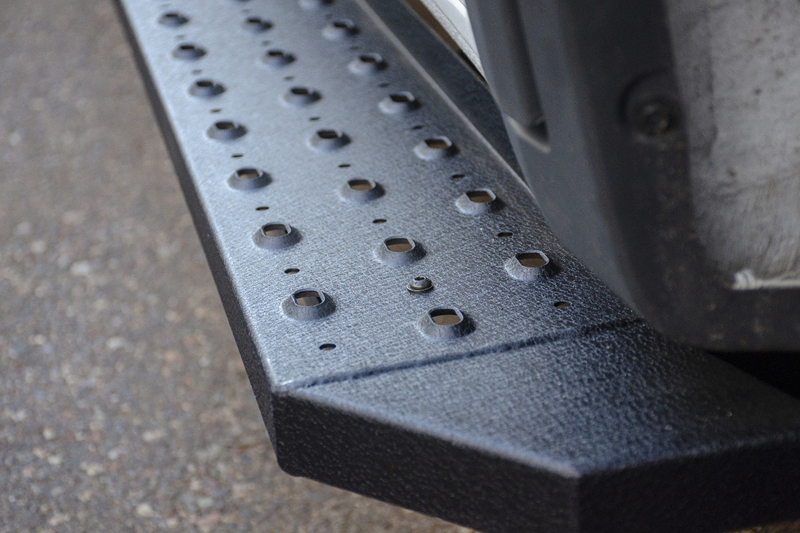 RidgeStep® running boards install using our innovative VersaTrac® mounting system. 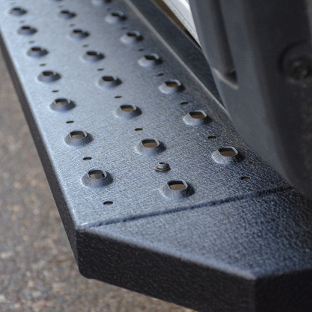 Vehicle-specific brackets bolt onto the vehicle using factory mounting points for no drilling required. The boards then bolt onto the brackets using a channel system for easy adjustment. The VersaTrac® system is used on a number of ARIES running board options. 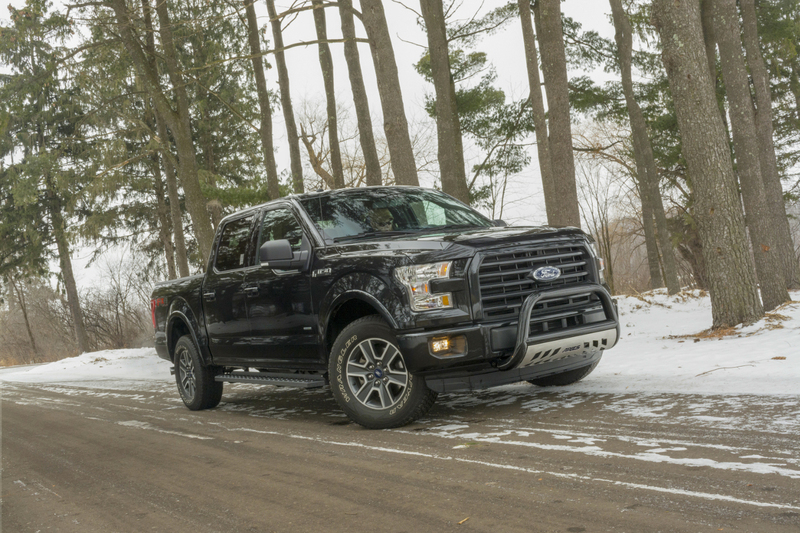 With the vehicle-specific brackets installed, various running boards may be attached, giving you more freedom to customize your truck based on personal preferences or the changing seasons. 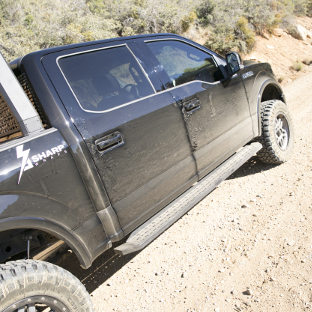 RidgeStep® running boards are not just for work trucks. 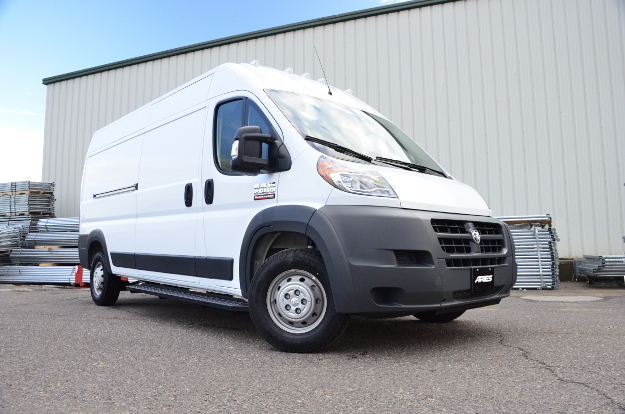 We also offer unique configurations for commercial cargo vans. 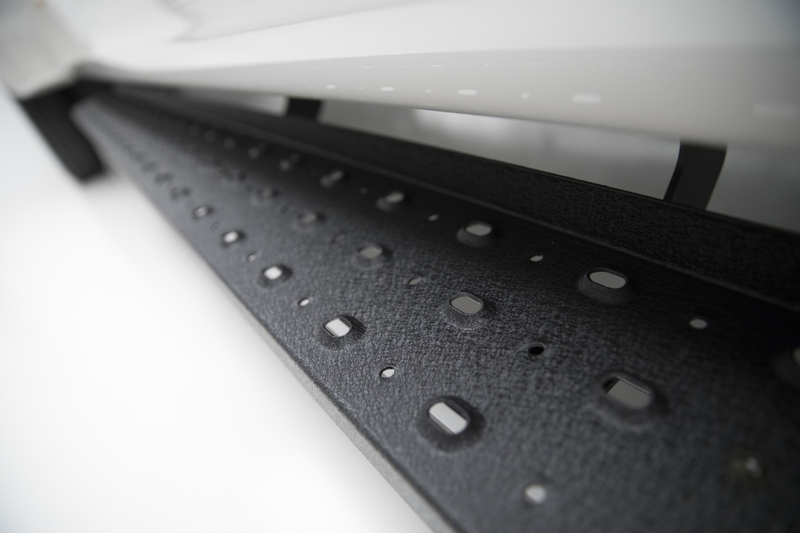 These running boards are available in short / long configurations to accommodate the layout of full-size vans. 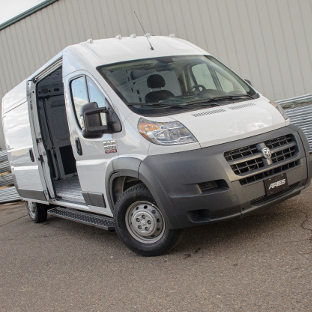 RidgeStep® running boards for vans feature the same high-strength, all-steel construction as our truck applications. 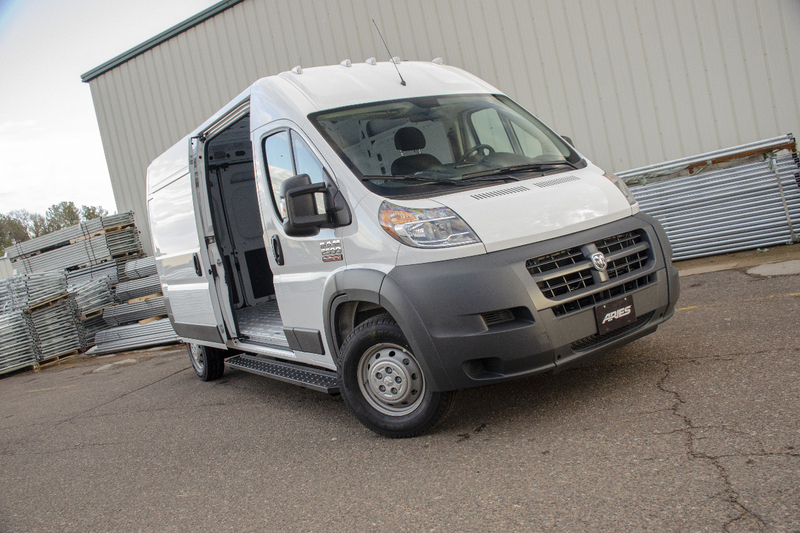 The textured powder coat finish is perfect for frequent exposure to the elements, especially on delivery vans.